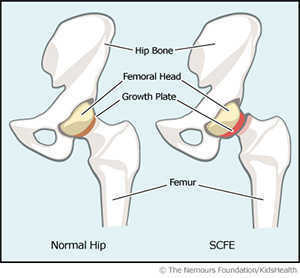 Slipped Capital Femoral Epiphysis, also known as SCFE, is a hip problem that most frequently affects 10-14 year old boys and 9 -15 year old girls. The growing end (epiphysis) of the thigh bone (femur) slips off from the top of the femur. This can happen in one leg or both. It is more common in boys, African Americans, and Polynesian populations. How is a SCFE diagnosed? If diagnosed with a SCFE, your child should immediately stop putting any weight on the leg and should be seen by an Orthopaedic surgeon for surgery. The goal is to prevent bones from slipping further. Your child will be on bed rest until surgery to prevent further damage. Usually, a screw will be placed through the growth plate in the femur. The goal of the screw is to hold the femoral head in its current position to prevent further slippage. This screw will help close the growth plate. This is done through a small incision at the top of the thigh. The area will be covered with a dressing. Your surgeon will go over the risks of surgery including: limited range of motion (from the injury, not the surgery), infection, bleeding, the need for further surgery and persistent gait abnormality. Expect your child to stay in the hospital for 1-2 days after surgery. Your child may have pain medicine as needed. After surgery, your child may drink clear liquids. When they are doing well with those, he/she may return to a regular diet. A physical therapist will teach your child to walk with crutches or a walker. Your child may not put weight on the affected leg for as long as your doctor specifies. Usually some weight bearing is allowed by 6 weeks. Your doctor will give you specific directions for your child. The dressing will remain in place until your follow-up visit, one week after surgery. You will need to have a follow-up appointment in clinic and an X-ray one week after surgery. If you have a question about your child on a night or weekend, call the main hospital phone number and ask operator to page orthopedic resident on-call. Your child may return to school, using crutches, in 3-5 days. Check with your school to see if they are able to assist a child on crutches (i.e. an elevator, “buddy system”). If the school is unable to accommodate your child, we can send a request for home instruction. Your child may shower 7 days after surgery, after the follow-up appointment. Your child can not submerge under water in a tub until the incisions are completely healed. We will give you a prescription for pain medicine to give to your child at home. Your child may not participate in gym or contact sports for several months and possibility a couple of years, until the growth plate closes. This will be determined by your surgeon. If you have questions, please contact Children's Orthopeadic Clinic or request a referral from your pediatrician.